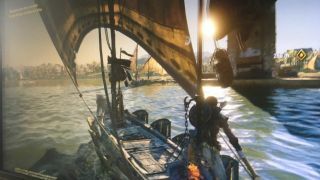 Okay, let's be cautious here but this Reddit post could be the first shot of the next game in the AC series, possibly called Assassin's Creed Origins. I'm in the process of trying to verify this, so treat it with extreme caution for the time being. It does match up with rumours currently floating around that the next game's set in Egypt, will be called Assassin's Creed Origins and have a much more Black Flag like vibe, with a massive open world and two main characters. The poster claims modern day sections will return and that it's using a revamped version of the Anvil Engine to enable more seamless transitions through the world. He reiterates that the Black Flag team is working on it, so Black Flag 2 essentially? If it is fake then it's beautifully made. The 'assassinate the crocodile' sub-mission is a nice touch and harks back to the 'air assassinate an ocelot' from Black Flag. The main mission says 'Follow Shadya to Khenut's villa'. Khenut, according to wiki was "a Queen of Egypt, the wife of King Unas. She lived during the time of the Fifth dynasty of Egypt." So that matches up with the series' use of historical characters. I'm not getting a hit on Shadya though. I've contacted Ubi but I'm expecting a firm 'no comment' [UPDATE: I've received a very firm 'no comment'] and, as I said there's no proof this is legit yet, this is repeating info that has already been rumoured. I'm chasing it up now and I'll keep you posted. The man on the ship also matches this (since removed) image leaked a few months ago - that's the same shield and trousers as this new shot.